This will be a short review as I've reviewed other books in the series extensively over the past few years and don't want to repeat myself too much - you can see my other reviews here. 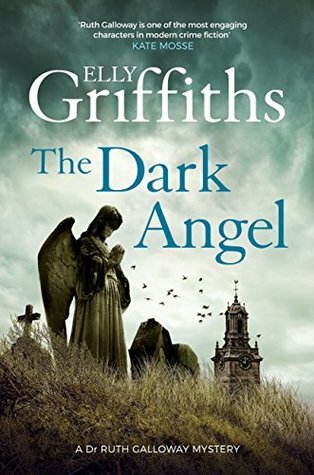 The Dark Angel is the tenth novel by Elly Griffiths about forensic archaeologist Ruth Galloway. This time, Ruth leaves her home on Norfolk's saltmarsh coast for an impromptu trip to Italy, where an old flame, Angelo, wants her to take part in a TV documentary about some recently-discovered Roman remains. But trouble seems to follow Ruth wherever she goes, and it's not long before she finds herself caught up in the investigation of a much more recent death. Meanwhile, DCI Nelson is still married, uneasily, to Michelle, who is pregnant at 46 with a baby that may or may not be his. Nelson, of course, is the father of Ruth's six-year-old daughter Kate, a result of an on-off affair, so things can only become more complicated. I was worried that by transplanting Ruth to sunny Italy from the wild, blustery Norfolk coast and her cottage on the saltmarsh some of the atmosphere of the other books in the series might be lost, but Elly Griffiths builds such a strong sense of place in her descriptions of the tiny Italian hill town near Monte Cassino where Ruth and her friend Shona stay for the duration of the action that I needn't have worried. I could almost feel the Mediterranean sun on my shoulders and taste the homemade limoncello as I was reading this book during a sleet storm on a dark British Monday in February. The story also touches on Italy's role in World War II and the resentments that still simmer where family ties are strong and the descendants of fascists and resistance fighters still live side by side - something I hadn't really considered before. As always, despite the change of setting, familiar faces from the previous novels soon pop up, and very welcome they are too - Ruth's druid friend Cathbad will always find a way to turn up in his purple cloak whenever he's needed, even when he's an Easyjet flight away. The Dark Angel is as much about Ruth and Nelson's relationship - and Nelson's relationship with his wife - as it is a murder mystery, and there's certainly plenty of drama on that score; this is a cracking installment in a very strong series. However, you do really need to have read the other books in the series (certainly the most recent ones, anyway) for this to mean much to you - Ruth and Nelson do have an awful lot of backstory and it certainly helps if you're fully invested in that when you read this book, as the real rollercoaster ride here comes from their personal lives as much as the mystery plot. The Dark Angel is now out in hardback and for Kindle. As this blog went live the hardback was the cheaper option.